Revolution in "seeing" or depicting what is viewed. "Our sense that linear perspective renders a scene truly is purely cultural." Arthur Zajonc, Catching the Light. Bantam Books, 1993. p. 64. God as depicted by Giotto and Michelangelo and Masaccio. Changes in drawing, painting, and sculpture from the 12th to 15th century Medieval to Renaissance art in western Europe. At the beginning of the 12th century, as depicted in the above sample of Italian art, there is a depiction of the Book of Revelations without resorting to the employment of perspective. We have become so accustomed to perspective in the portrayal of scenes and people in painting since the European Renaissance, that we may not fully see the difference. So compare the above painting to the Crucifixion, by Masaccio, in the 1420s to Michelangelo's painting below, and to the Giotto fresco above of similar themes: The Last Judgment. 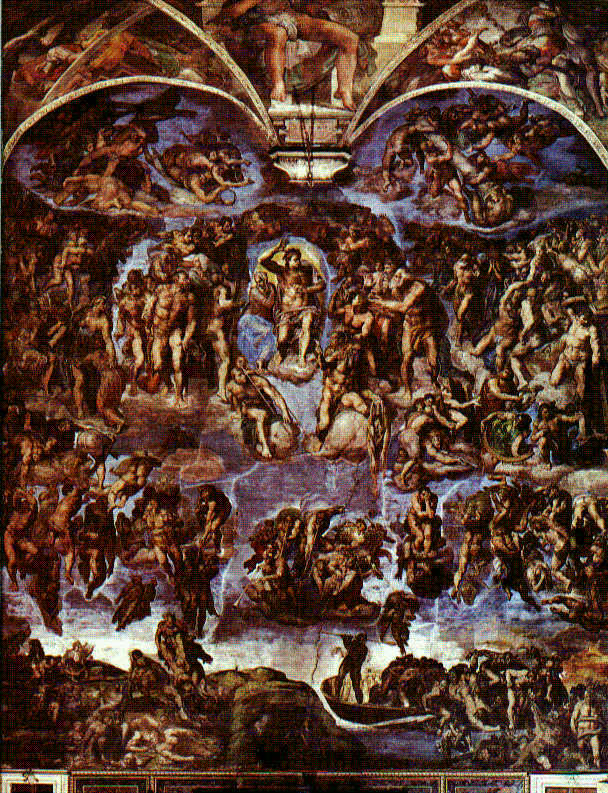 Michelangelo's The Last Judgment [1534-1541] from the wall of the Sistine Chapel. Perspective is a western artistic tradition generating an illusion generally created by use of the "linear perspective system," based on observations that objects appear to the eye to shrink and parallel lines and planes converge to infinitely distant vanishing points as they recede in space from us the viewer. "The principles of linear perspective derive from Euclid's concepts of the visual ray and the visual cone as elaborated by Ptolemy and al-Kindi." 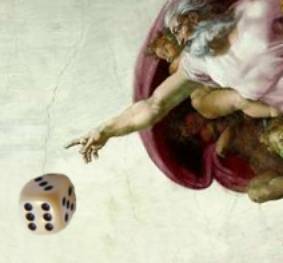 "The pre-Renaissance history of perspective is complex and controversial. As the eminent historian Erwin Panofsky has argued, 'each period in western civilization had its own 'perspective,' a particular symbolic form reflecting a particular Weltanschauung or world view." Arthur Zajonc, Catching the Light. Bantam Books, 1993. p. 65. Animals in the hall way, or are they? Inspiration: At the beginning of the 15th century Filippo Brunelleschi worked out the same basic principles of mathematical laws of perspective –including the concept of the vanishing point– known to the Greeks and Romans but later discarded by Byzantine and Gothic artistic expression in the west. "Elements of perspective can be found dating back to the Greeks, but not until 1425 did a coherent, clear understanding, of linear perspective appear. Brunelleschi and the Renaissance longed to see and represent the world in accord with 'visual truth,' as Lorenzo Ghiberti called it. They 'endeavored to imitate nature,' to school their sight on the mathematical lawfulness of nature. They incorporated into themselves the geometric spirit that breathed through the age and thereby helped lay the foundation for the style of scientific investigation to follow." Byzantine mosaic from Ravenna versus a Renaissance painting from Florence almost 1000 years later. Art of mosaic was the expression used by Byzantine crafts people. 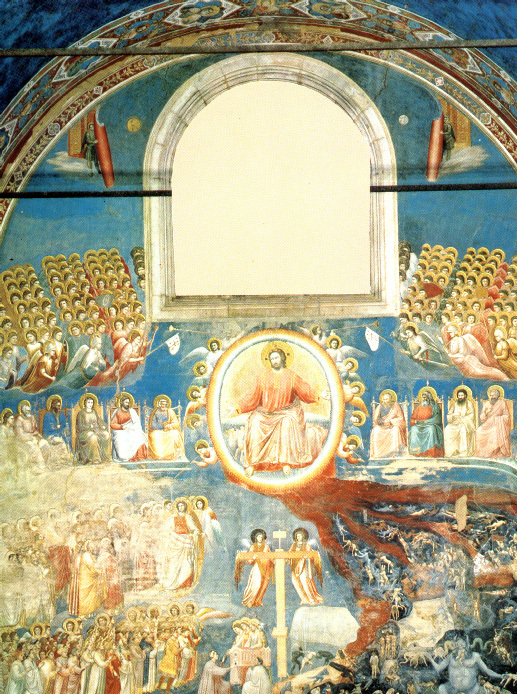 From the apse of the Cathedral in Ravenna is this 6th century A.C.E. 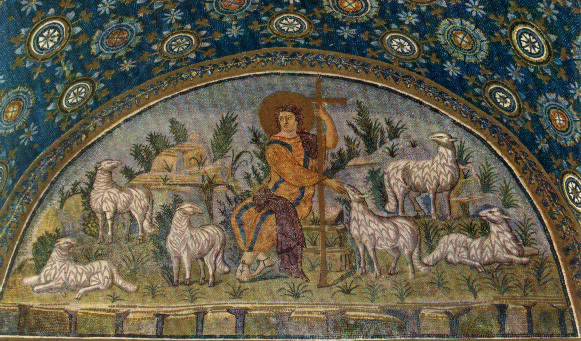 mosaic, depicting Christ as a good shepherd; shown here is the focus of artistic expression, the savior, with background objects, not in perspective to one another. Instead they are arrayed in relation to the object of adoration Jesus as the pastoral keeper of domesticated flocks. Each stone piece in the composition is made of different colors of fired glazed ceramic, the disparate parts forming an instructive whole depicting divine saving grace. Consider now the same use of a vaulted space filled-up in a different way. 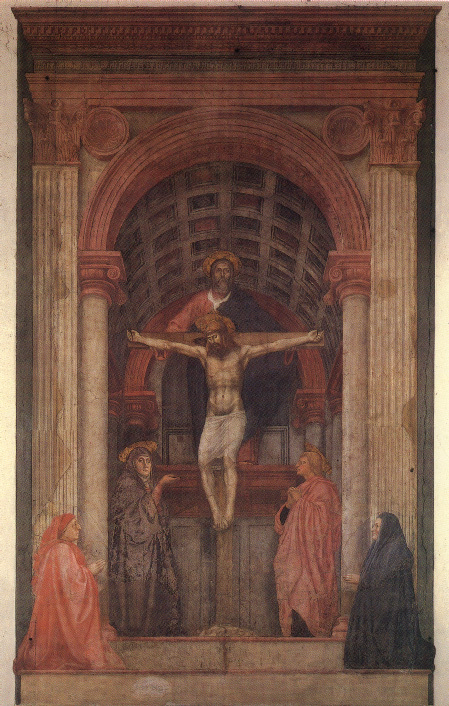 These principles of linear perspective based on the use of converging parallel lines were applied to painting by Masaccio in 1427, especially in his "Trinity" fresco in Florence's Santa Maria Novella. The focus on the trinity is accentuated by the depiction of the barrel vault accentuated by the use of perspective. The meaning of this artwork is disturbing, if you think about it. Source: By 1435, in his book "Treatise on Painting," Leon Battista Alberti codified the rules of perspective for painters. Based on plane geometry, Alberti explained that "vision makes a triangle, and from this it is clear that a very distant quantity seems no larger than a point." In the drawings below f on the left and C on the right is that point. The imaginary vertex of the visual triangle is called the distance point or vanishing point in linear perspective. "By 1525 the spirit of the artistic–scientific perception had so developed the Albrecht Dürer could publish his unique Painter's Manual. Opening it, one does not find a single section on color or painting as such. Rather, it begins with instructions concerning geometrical construction of spirals conic sections, then goes on to polygons, the Pythagorean theorem, towers, sundials, and regular and irregular solids. Nowhere is the spirit of the manual, and so of the period, more evident than in the final section on linear perspective." 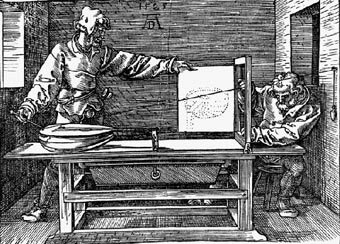 Albrecht Dürer 's depiction of the artist rendering " 'visual truth'. Look at true perspective and the illusion of three dimensions on a flat (two-dimensional surface) plane. The illusion of the viewer as an important ingredient in the depiction of what is viewed marks a shift from the object portrayed in the painting as central to an axis of importance. The use of perspective is what makes this shift from central depiction to object tied into subject possible. That axis of significance ties the object to the precise place where the viewer is observing the scene. This shift to a dual foci from a single focus means that not just the artistic object we are intended to see is of significance. The importance of perspective is that it provides us with the illusion of "being there"–within the artist's own vision– before us it seems we are in the painting. 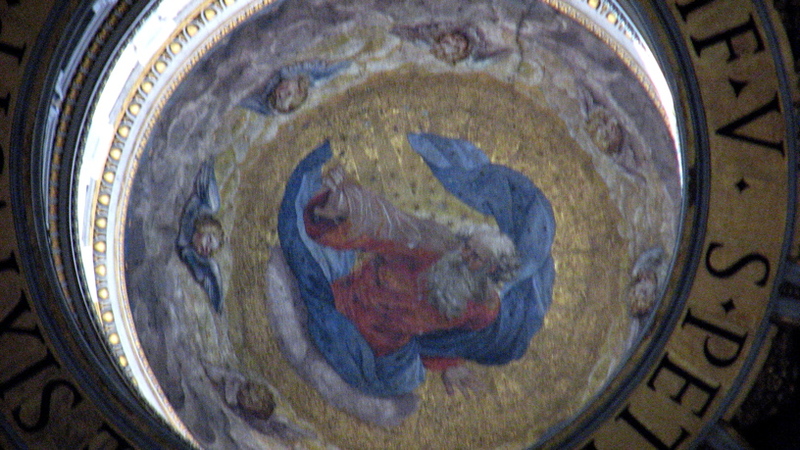 Michelangelo's Sistine ceiling of God and Adam Raphael's dome in St. Peters. 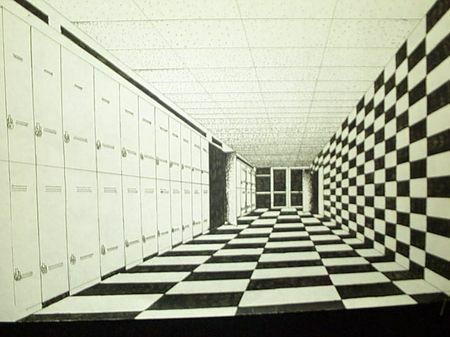 The illusion that this drawing technique of perspective affords an artist using linear perspective also enables the viewer to engage in the deception the artists are perpetrating. "Linear perspective," Martin Kemp suggests "is about the portrayal of the position and relative scales of objects in Euclidean space. Yet in its pictorial mode, it creates and illusion which can only be used to provide measured definition of the dimensions of forms. . . .
"To overcome this shortcoming, a special mode of perspectival depiction was developed for technical drawing, above all for fortifications, that both presented spatial effects and retained dimensional accuracy. It became the specialty of military draftsmen, engineers, and stonecutters in the eighteenth century." *A technique in drawing that creates the illusion of depth in a three-dimensional space on a two-dimensional plane–flat surface. Arthur Zajonc, Catching the Light. New York: Bantam Books, 1993. Martin Kemp, Visualization: The nature book of Art and Science. Berkeley, Ca. : U.C. Press, 2000.